Crackdown 3’s best moments come in utter chaos. You leap between buildings to dodge hails of bullets while dropping a similar maelstrom of rockets onto enemies below, all the while looking for a path to the specific glowing bit you need to launch an explosive into. Almost every activity on the game’s map requires you to shoot a lot of enemies, and encounters continually escalate as you keep hungrily killing. It’s competent, unambitious action that’s fun in the way every open-world game you’ve played since 2001 has been fun. It lets you jump on top of buildings, collect agility orbs, and then jump on top of taller buildings. It lets you point rocket launchers at bad guys and laugh at their ridiculous ragdoll animations. It offers the compulsive satisfaction of ticking boxes and filling completion lists on an open map. It’s full of utterly benign entertainment that’ll pleasantly fill eight or more hours, which you will then promptly forget. You are Commander Jaxon of the Agency, whose real defining trait is that he’s Terry Crews. You’re looking to liberate the island city of New Providence from the evil corporation controlling it, Terra Nova. After an amusing bit of bombast from Crews, the Agency dropship is blasted from the sky and you’re reduced to a burned-up husk in a medical tank. Then you can reconstruct yourself – either as Terry Crews or any number of other agents whose defining traits are typically that they are not Terry Crews – and hit the city to take down Terra Nova. You can go through that reconstruction process at any time, from any safe house, regardless of considerations like race, gender, or the consequences of limitless plastic surgery. 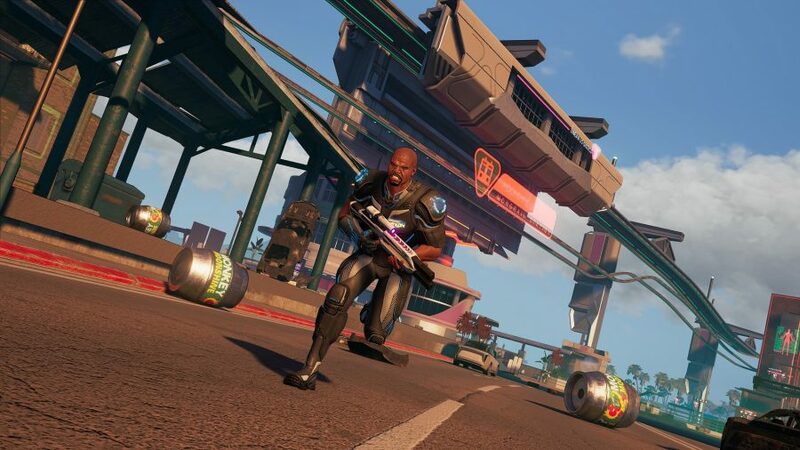 That devotion to freewheeling openness is Crackdown 3’s best trait. You’ve got three weapon slots, which work pretty much like primary, secondary, and power slots many other games would have – except for the part where you can put any weapon in any slot. Want nothing but rocket launchers? Sure, that works, and it’s not even a bad strategy. The game uses the same lock-on system as the original, in which holding a button will place an unbreakable crosshair on the enemy closest to the centre of your view. If you’re using a precision weapon, you can flick around VATS-style to target specific body parts, though there’s rarely a reason to go for anything other than the head. It doesn’t take much skill – instead, the challenge is in managing a field of enemies to keep yourself from getting overwhelmed. There are fun little bits of design, like the way your shields recharge as you gather experience orbs from defeated enemies. That means you’re incentivised to be constantly on the move, quickly killing enemies to keep your health up, rather than hunkering down waiting for your shields to refill. It’s an exhilarating nod to id’s latest Doom. Certain boss fights will hit you with near continuous damage, which you can only really mitigate by taking out the swarms of smaller enemies that fill the arena. Your arsenal offers a wonderfully varied catalogue beyond the expected shotguns and assault rifles. The pulse rifle lets out a fiery beam that satisfyingly melts enemies. The Decimator and Jackhammer each fire unique flurries of rockets, for when you need something a bit flashier than a standard RPG. With that quick lock-on, it’s easy to pick a target, fire something powerful, and be on to the next by the time the explosions even start. A moment into any fight, you’re surrounded by booms, the familiar rhythms of destruction. That destruction won’t apply to any part of the environment around you, though. The impressive environmental destruction tech demoed years ago is completely absent from the campaign. Now it’s purely part of the game’s multiplayer, which comes in a standalone client. The single-player world is essentially static – both in the literal sense that you can’t blow holes in walls, and in the sense that there’s little personality on the streets. 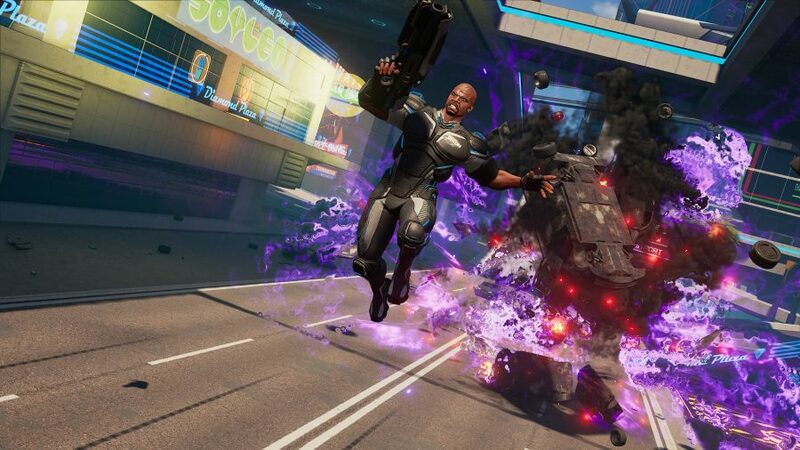 Terry Crews calls Crackdown 3 a “Terry Crews simulator,” and while that’s an appealing proposition, it’s not really the case. Even if you stick with the default agent, you’ll hear precious few bits of dialogue from the Brooklyn Nine-Nine star - though you will occasionally get some good Crews-voiced pep talks when you take over the city’s propaganda stations. You can kill civilians with no effect outside of an admonishment from your handler over the radio. The story sets up a sort of tension between two heroic factions, with the ‘kill the bad guys at any cost’ mantra of the Agency on one side and more populist ‘help the people’ mission on the other, but that never pays off. One side activity has you rescuing civilian prisoners who’ll then join a militia uprising against Terra Nova – which basically means there are sometimes people with friendly blue dots over their heads nearby when you’re doing the work. 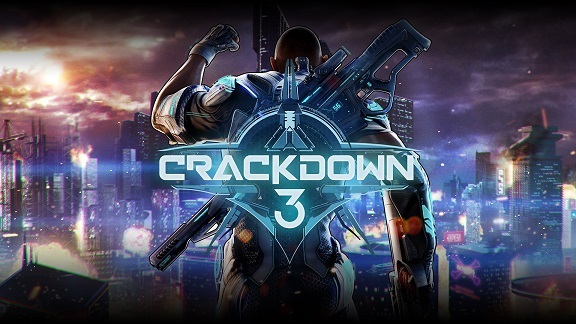 A nuanced, moral treatment of revolution is not what Crackdown is here to provide, but the game’s in desperate need of something, anything, to lend it a sense of weight, personality, or progression. Your goal at the outset is to kill your way through the lieutenants of Terra Nova, then finish off the company’s evil boss. You do exactly that. And hardly anything more. Moving forward is a matter of completing map activities until you unlock a boss fight. Blow up some pipelines to draw out the head of the refineries, then kill him to get at the boss of the whole industry division. Repeat similar actions until the eight named bosses are dead, then go beat the big bad and finish the game. Their lairs are just locations on the map. There are no discrete story missions, no characters to interact with in the world, and no twists on your journey to beat the boss at the end of it all. The original Crackdown’s best feature was its superpowered movement, which you could regularly upgrade by collecting agility orbs. 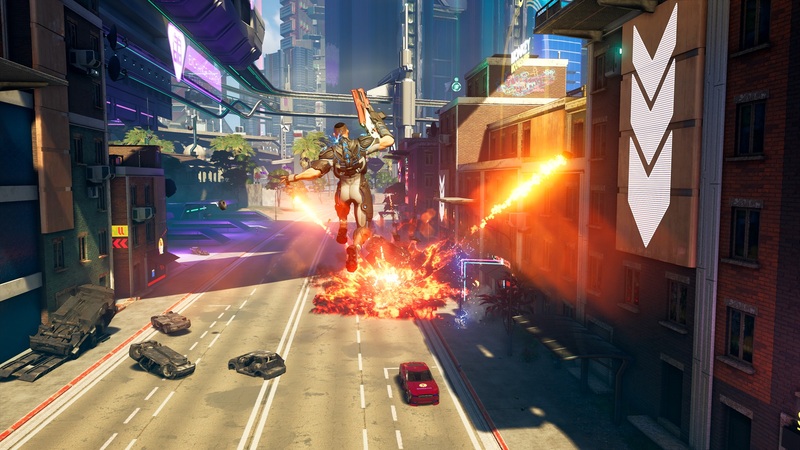 Crackdown 3 has those same continually-improving leaps, but now you can also earn double jumps and air dashes as you level up. It’s a step toward making movement more fun, but it’s the part of the game that feels most locked to the past. This doesn’t feel like a game that’s come after a decade of Assassin’s Creed parkour, or the free-flowing navigation of Sunset Overdrive, or even the utter silliness of Saints Row IV’s superpowers. Ironically for a game with such big leaps, it reaches no heights of its own. While the separate multiplayer client suggests that Wrecking Zone is a substantial addition, it’s anything but. There are just two modes, both 5v5 – one where you attempt to hold control points, and one where you have to collect badges from downed enemies for points. Multiplayer uses the same rigid lock-on system as the single-player game, so you can skillessly target enemies and pour rockets on them. Any direct confrontation will go to whoever has more health, so effective play means using jumps and dashes to evade fire – which is then complicated by the fact that any wall can be blown apart with ease. The two theoretical selling points here – your mobility and environmental destructiveness – just serve to make the handful of tiny maps feel the same, since no obstacle can impede your progress. That feeling of sameness isn’t helped by the small selection of weapons, which you can switch between any time you respawn. You can choose a character on the main menu, but that’s just a skin. There’s nothing to unlock, and while a lack of multiplayer progression might be refreshing over a decade after Modern Warfare, the skill ceiling feels so low and there’s so little variety that there’s not much reason to keep playing. 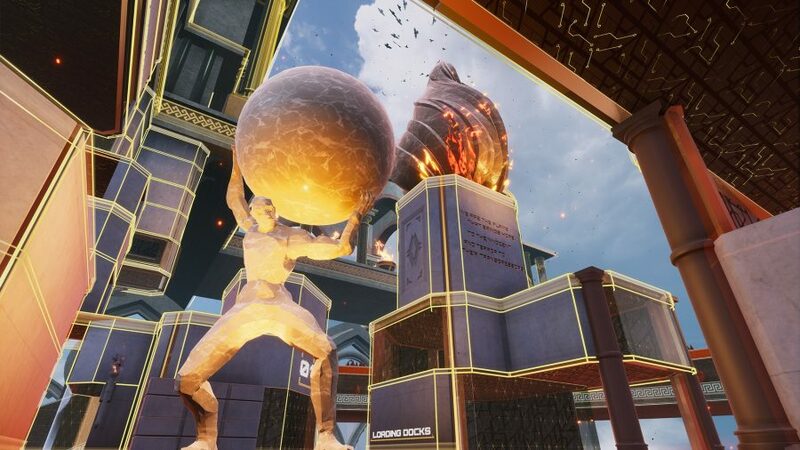 Wrecking Zone feels like an afterthought – a half-hearted way to keep some form of that Azure-powered destruction in the game. 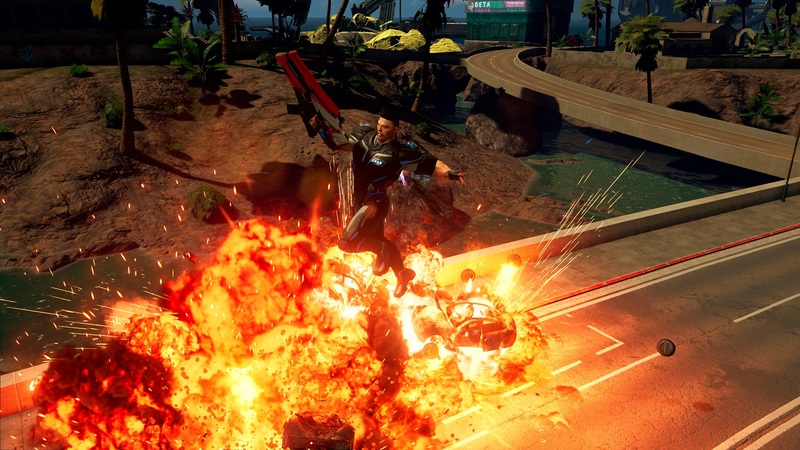 Crackdown 3 feels like it fell out of a time machine. Either one from 2007, when it would’ve seemed at least a little fresh, or from 2027, when some indie developers passionate for the games of their youth decided to make a back-to-basics throwback to an era of open worlds with little for you to do but run around, shoot, and pick up collectibles. Competent, with enough fun weapons and silly spectacle to make it inoffensive entertainment. While a half-decade of development hell could’ve ended with worse results, it’s tough to muster much excitement for what’s here.